I am writing this between my 2 shifts. The morning session was calm-ish. The architect of yesterday’s belligerence was brought out to the bus by his grandmother. “Why did he come home so upset?” She asks. “He had a row with a girl about some beaver”. I reply rather disingenuously. I hear a shriek behind me as the girl tears up the note. Probably a split infinitive or a misspelling I guess. Grandma and I exchange kinda female motherly “well what can you do?” expressions. I pull away and increase radio volume to max. Kelly Clarkson belts out “BECAUSE OF YOU” in an accusatory tone of voice. Yes that’s quite right Kelly – it is always because of those others isn’t it. I sing along. I …. I am an artist I tell myself. “His Gran asked me what had happened this morning.” I say. “I speak to all kinds of people…I can’t help it.” I reply with an irritating antagonistic simplicity. The tutor knows she’s taken a jab but can’t quite figure it. To patronise or not to patronise? – That is the question. She is an educational professional. She can’t help it. She gives me a hard look. I tweak an eyebrow and stare her out. I never did take to teachers you know. A couple of days ago I did a mass shoppage in ASDA. I won’t go on about how they have reduced the size of pack weights and kept the same prices. Anyone who thinks that price inflation is 5% either hasn’t got weigh scales or a memory. Anyway, I wanted purity, cleanliness and British tradition. 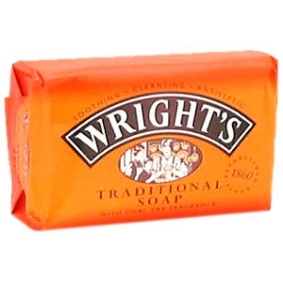 I bought 2 bars of Wrights coal tar soap,( I have never seen this in France). A whole childhood of coarse damp towels, icy bathrooms, stinging eyes and tender flappy bits flashed through my mind. Coal Tar – a substance so brutal that germs commit suicide rather than do battle. I studied the wrapping. It is now “traditional soap”. In very small print underneath are the words “with coal tar fragrance”. Surely not! Has this last link to virginity and purity been defiled? I study the label. In even smaller print are the words “Made in Turkey”. Everything is crumbling. Prime Minister Cameron wants me to pay off my credit card and celebrate a gay marriage in his Tory conference speech today. I just want to soap my bits in an aroma of Empire and BRITISH industrial carbolic. I saw a sign outside the local pub. “Pint of Stella Artois and a Madras curry for £5.” Thank you God. Some traditions stretching back to the Ancient Britons still survive. Emma thinx: Diversity – a university for twins. This entry was posted in Bus Driving, Emma Calin, English Working Class Life, Personal hygiene by emmacalin. Bookmark the permalink.